Working as a transcriber is both liberating and stressful. This article goes over the benefits and drawbacks of at-home transcription, the basic requirements to transcribe, the tools you’ll need, and some job resources. Work as much or as little as you’d like. Accept and turn down projects at will. Take breaks, get up, cook meals, and get exercise. No more driving into the office every day or ride public transportation. You will save money on gas & transportation. The stress of a commute adds up over time. No more traffic jams and bad weather to deal with. Have a bad night’s sleep? You don’t have to worry about getting up at the crack of dawn. The stress of trying to land freelance work. Transcription contracts come and go. You’ll land a great contract, but it may be short-term. You have to keep track of your expenses, your income, and put aside money for taxes. Hiring a bookkeeper or accountant may be necessary. You’re in the house everyday typing. There’s nobody to bounce ideas off of or to help you out if you’re in a jam. It can get lonely working by yourself with headphones on all day. So if you want to socialize and meet others in the field, you’ll have to seek out online groups or Meetups. But this article assumes you are deciding to make the leap, or at least part-time to maybe more some more money. One job that is always in demand is audio and video transcription. Transcribing from home isn’t as easy as it seems. There’s some basic qualifications that if you don’t meet then transcribing from home might not be a good fit for you. To make a decent wage you’ll need to type at least 80 Words per Minute accurately. Using email and some advanced email features. Installing software and keeping it up to date. You’ll need to use the internet for research & to search for job leads. Transcribers also need an up to date computer that can load large video files. You’ll need high speed internet to be able to download files for transcription. So you may have to upgrade your internet. Once you’ve met those qualifications you’ll need to put. The reason you need a foot pedal to transcribe is you are using your hands to type, but if you want to hit play/rewind/fast forward you don’t want to slow yourself down tremendously by trying to control your or video with your hands, so you use your feet. You’ll also need a good pair of headphones to listen to the audio while you type. Once you’ve set yourself up to transcribe then your next step is to go out and look for transcription jobs. Set a Google alert for “audio transcription.” You’ll get daily emails from new articles and posts. Sometimes these Google Alerts will have jobs leads. I hope this article was helpful. Let us know if you have any questions. Happy transcribing! Click here to see our reviews of the best transcription software. 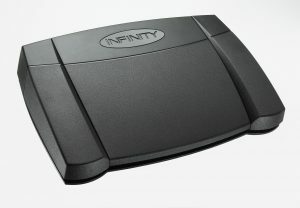 Which is the Best Foot Pedal for Transcription? Thank you so much for your article. I am preparing to work part-time from home, and I was really nervous about it until now. Thanks for setting my mind at ease and building my confidence! That’s great! I’m glad this article helped and good luck with your endeavors!